Goodison Park is the football stadium of Premier league club Everton F.C and was one of the first purpose-built grounds for football in the world. Since opening in 1892, Goodison has hosted more top-flight games than any other stadium in England, even more than great rivals Liverpool. 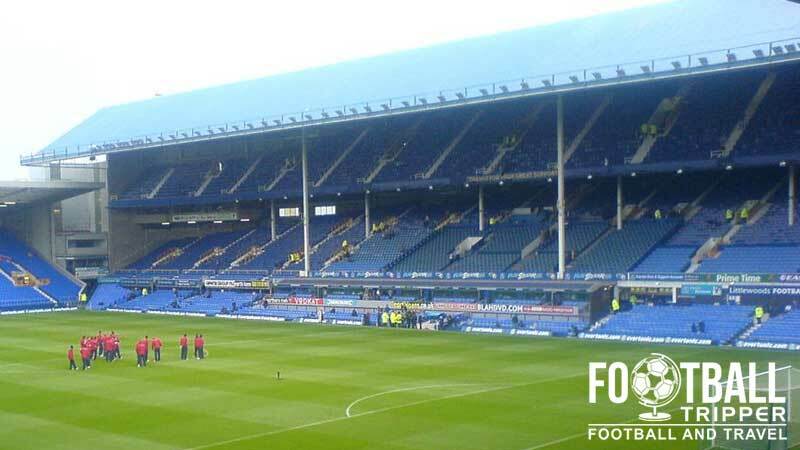 Before establishing their home at Goodison Park, Everton previously played at Liverpool’s Anfield Stadium, and were in fact the original tenants, even helping to construct the stands which held 20,000 supporters. The Toffees were forced to move out however after a rent dispute with land owner, John Houlding, who more than doubled the price of rent from after just a few seasons of being there. The two parties went their separate ways, and the rest as they say is history. Everton moved to new facilities at Goodison, north of Stanley Park, and Houlding opted to form a new football team instead. They would of course later go on to become Liverpool FC, Everton’s greatest rivals and rather unfortunately their more successful neighbours. After receiving a £1,000 interest free loan from fan Dr James Baxter, the club were able to build England’s first purpose-built football ground. Consisting of three stands, and a total capacity of 12,000, the ground opened on the 24th August 1892 which was exactly the same day Celtic Park was also being inaugurated. By the start of the 1938/1939 season, each stand at the Archibald Leitch designed ground consisted of two-tiers, and Goodison had developed its reputation as one of the greatest grounds in the country. 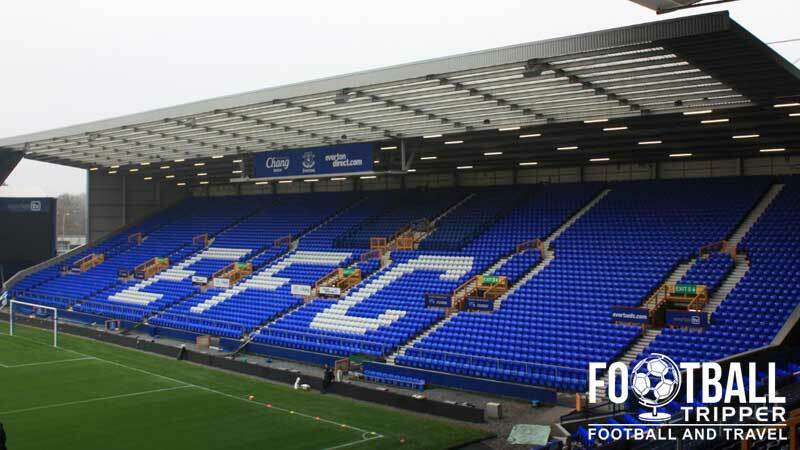 Parts of the ground were rebuilt in the late 1960s and 1970s and in August 1992 Everton entertained Borussia Mönchengladbach in a centenary match. After the publication of the Taylor Report in 1990 Goodison Park was converted to all-seating. Borne out a tragedy which was very close to home for all residents of the city of Liverpool, Everton opted to convert two of the stands to seating, and to replace the Park End with a single-tier cantilever stand in 1994. No major renovation work has occurred since. 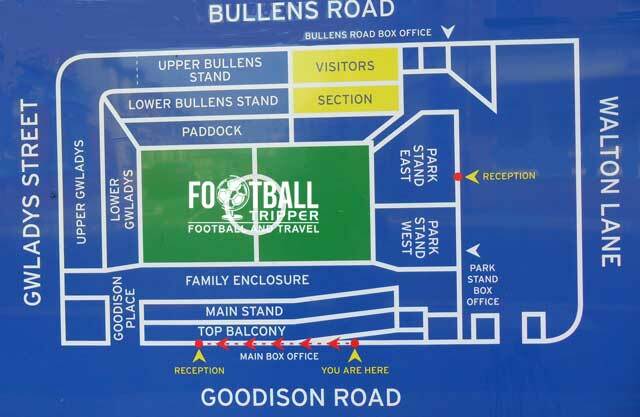 Goodison Park is comprised of the following four sections: Gwlady’s Street Stand (North), Bullens Road (East), The Park End Stand (South) and The Goodison Road Stand (West). 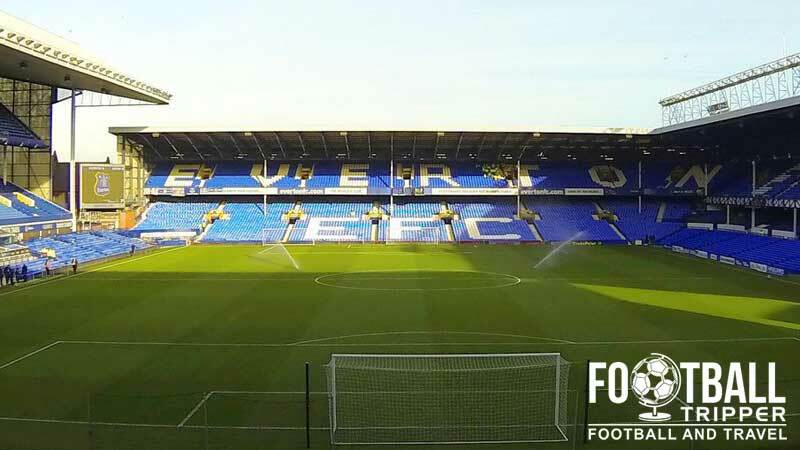 Fans who make the trip to Goodison Park to watch their team take on the Toffees are housed within one corner of the Bullens Road Stand which runs for the length of the pitch on the eastern side. The allocation of around 3,000 tickets is usually split across the two-tiers, although for some matches it is reduced to 1,700 across the lower tier. Unfortunately as one of the finest examples of 20th century British stadium architecture the ground feels somewhat dated today which can, for some fans, detract from the matchday experience. Most notably there are 9 support beams in the lower tier and four in the upper which can greatly restrict the viewing angle of certain seats. This issue is compounded by the low-height of the roofs, and from the back of both tiers getting an unfettered view of the pitch can be challenging – particularly if everyone is standing. The concourse is also well past its sell by date but its these types of imperfections which make the experience so unique and memorable. Plus the Everton fans are always in great voice. Similar to the Anfield experience, there are a few local pubs around Everton’s Goodison Park with the obviously named Goodison Bar one such example where you may want to avoid if you are an away fan – not that the Evertonians aren’t some of the friendliest fans in the country mind! Two popular pubs 15 minutes away which accommodate a mixture of both home and away supporters. The Thomas Frost Pub and Bradleys Wine Bar on the A59 Walton Road. The former is a Wetherspoons Bar and the latter, Bradleys, is more of a family pub than the misleading name suggests. Outside of Lime Street Station in the city centre there is the likes of The Vines Irish Pub and The Dispensary “Pub of the year”, as well as large chains such as Yates’s, Wetherspoons and Walkabout. Inside the ground there is Chang beer on sale who have been sponsors of the club since 2004. If you are coming from the centre of Liverpool or Lime Street Train station then you are spoiled for choice when it comes to fast food with there being too many options mention. Less than 5 minutes from Goodison Road there are a lot of takeaway places to choose from including McDonald’s, KFC and Greggs. These are all on Walton Road. Inside Goodison Park the food stalls sell the usual matchday muck including a Scouse Pie which is a meat stew meets casserole within pastry. Matchdays: Closed during the game and open for one hour after. The name of the club shop is a piece of masterful “banter” by Everton. The second club shop sits within the Liverpool One shopping centre. The full address? Everton Two, Liverpool One! 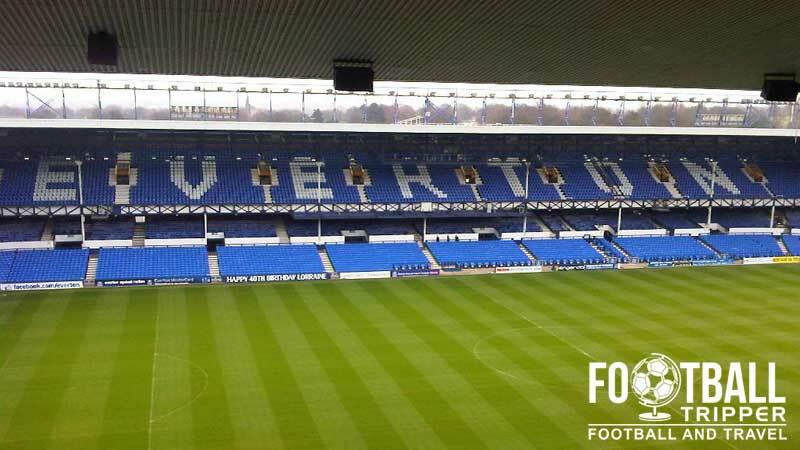 Everton offer fans the chance to see Goodison Park from behind the scenes with a tour which lasts 1 hour and 15 minutes at a price of £10 for adults and £5 for everybody else. Available on Monday, Wednesday, Friday and Sunday between 11.00 am – 1.00 pm, it makes for an interesting and fairly cheap part of a day out in Liverpool. For more information email [email protected] or phone 0151 530 5212 any time between 8.00 am – 6.00 pm Monday to Friday. Note: tours are not available on matchdays or the afternoon before a game. Goodison Park is around 2.5 miles north-east of the city centre and main railway station, Liverpool Lime Street. The most popular way of travelling to the ground is via an overground train service from the city centre. “Welcome to Goodison Park” looms over fans making their way to the iconic stadium. Goodison Road, Liverpool, Merseyside, L4 4EL. Regarding parking, there is a small number of street parking to be had spread out around Walton Lane but with residential parking permits being somewhat of a grey area you’re probably better off getting early and dumping the car at either Anfield or Stanley Park which both cost £8.00 each. Fans also recommend Walton Lifestyles Sports Centre which offers parking at £5 for the day, requiring a 15 minute stroll to the stadium. The largest railway station in Liverpool is Lime Street which is slightly too far for a pleasant walk to the stadium, but that’s not a problem as there are two train lines which take you pretty close to Goodison Park. The first is Kirkdale station which takes 10 minutes from Liverpool Central Station resulting in a 20 minute walk, and the second is Sandhills Station which is slightly further away. It has the added bonus of match day buses which run a few hours before kick off and for just under an hour after the full time whistle has been blown. Both Kirkdale and Sandhills Station require you to get a train from Liverpool Lime Street to Liverpool Centrals. Some fans recommend asking for a return to Goodison Park which includes the bus journey which saves a few pounds. The main departing bus depot, Queen Square Bus Station, is well signposted when leaving Lime Street railway station and from there you can hop on several Arriva Buses: 19, 19a, 20, 21, or the 311. Costing sub £2.00 for a journey, this will take you anywhere between a quarter of an hour and 25 minutes depending on the busyness of the roads. Named after one of the members of The Beatles, John Lennon Airport is Liverpool’s flight hub and it offers affordable trips to many European destinations. It is located less than 30 minutes away from both Goodison Park and Anfield stadiums making it very convenient. Depending on how close you wish to stay to either Goodison or city centre, some recommend Hotel Anfield or Epstein House for sheer proximity, whereas others prefer your standard “generic” hotel chain for taking in the sights of the city after the match. As a kind of go between, half-way between both, The Throstles Nest Hotel is also quite popular amongst fans.